Sage, pickle, emerald, seaweed, mint, lime, chartreuse and seafoam… no, it's not some weird recipe that cures any winter ailment, it's just a few of the shades of green you may want to wear during St. Patrick's Day weekend at Broadway at the Beach! From green drinks and eats to sharks and shamrocks to lacing up the running shoes with fellow leprechauns, there are many ways to celebrate the green weekend with us! A quick google search tells us that Saint Patrick's Day or the Feast of Saint Patrick dates back to the 17th century and is a cultural and religious celebration held every year on March 17th in celebration of the holiday's namesake, the foremost patron saint of Ireland! Although you are encouraged to don your favorite shade of green, you don't need the luck of the Irish to enjoy all of the festivities! Here's a quick three day Broadway breakdown of how you can celebrate the holiday all in one place! Before you enjoy all the tasty treats and sweet sips, you can kick off the weekend as you race around Broadway during the Shamrock-N-Roll 5K Run and Celebration on Friday, March 15th! The race begins at 6pm with the after party on The Avenue featuring live music by Backfire! For more information on the race and how to register, click here. Take the weekend fun to new depths of the deep blue as you wear your green at Ripley's Aquarium during their Sharks and Shamrocks event all day! There will be special food and drink offerings throughout the venue including beer and Irish spirits plus there is a Lucky Scavenger Hunt for all ages with a chance to win a grand prize! For more information on this event, click here! Start the day with brunch and all the games at Dave & Buster's Green Kegs and Eggs event beginning at 11am! With St. Paddy's day swag, a brunch buffet and unlimited game play at just $22 a person, we can't think of a better way to kick off the day! But of course, the fun and festivities don't stop there! You can also drink up some of those green brews and enjoy live entertainment at several places at Broadway including Jimmy Buffett's Margaritaville and Liberty Brewery & Grill all day! If the pre-spring breeze is more your thing, you can enjoy the official Broadway St. Patrick's Day Celebration Street Party outside on The Avenue featuring live music from The Kevin Nichols Band from 3pm – 7pm. Of course, you can get your fill of green beer and taste some Irish treats while you take in the sounds of live music! So whether you're a race runner, green beer sipper, Irish food taster or a live music listener, or you enjoy a little bit of everything, you can find it all this St. Patrick's Day weekend at Broadway at the Beach! The holidays are over and the decorations are coming down. There's a chill in the air and let's face it, sometimes the subtle post-Christmas gloom of January sets in causing some of us to hibernate this time of year. But this January, you have a chance to laugh your way out of the seasonal blahs at Broadway at the Beach's Legends in Concert during the limited engagement of Church Basement Ladies! So what exactly is Church Basement Ladies? 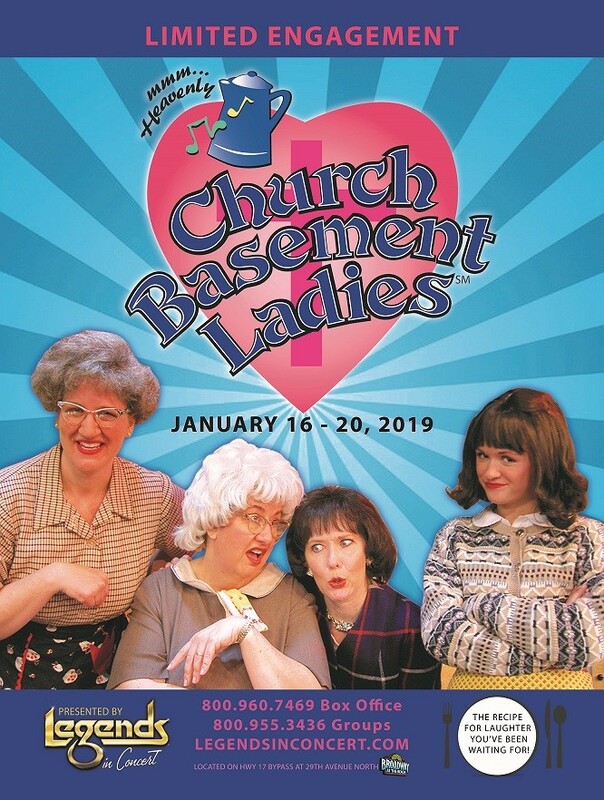 Church Basement Ladies is a national touring show presented by Legends in Concert and Troupe America, Inc. that uses the popular Scandinavian Lutheran humor writings of "The Lutheran Ladies," Janet Martin and Suzann Nelson, authors of a host of humorous books, the most famous being GROWING UP LUTHERAN. The show features four distinct characters and their relationships as they organize the food and solve the problems of a rural Minnesota church about to undergo changes in 1965. From the elderly matriarch of the kitchen to the young bride-to-be learning the proper order of things, we see them handle a record-breaking Christmas dinner, the funeral of a dear friend, a Hawaiian Easter Fundraiser, and, of course, a steaming hot July wedding. They stave off potential disasters, share and debate recipes, instruct the young, and keep the Pastor on due course while thoroughly enjoying and tolerating each other as the true "steel magnolias" of the church. Funny and down to earth, these ladies will be familiar to any audience as they witness the church year unfold from below the house of God. You catch one of eight performances January 16th - January 20th. For more information and to book your seat, click here. So before you choose to stay in and give in to those annual winter woes waiting for the first glimpse of Spring, and enjoy a night of laughter with the Church Basement Ladies at Legends in Concert. Boo! It’s Halloween time at Broadway at the Beach! Ghosts, Superheroes and Characters… oh my! Actually, oh Halloween! It's that time of year again when zombies, movie stars, princes, princesses and superheroes visit Broadway at the Beach. Okay, so they're not really the undead, big screen stars and royalty, but it's the perfect time for you (or your little ones) to dress up as your favorite characters and haunt, or roam around the villages of Broadway! The Grand Strand's largest Halloween Bash will be held Saturday, October 27th along The Avenue at Broadway! Vying for 1st, 2nd and 3rd place in the annual costume contest, this is the time when Halloween enthusiasts can go all out and compete for the coveted titles of best costumes as well as enjoy live music, entertainment and more all beginning at 7pm! For more information on this event, click here. 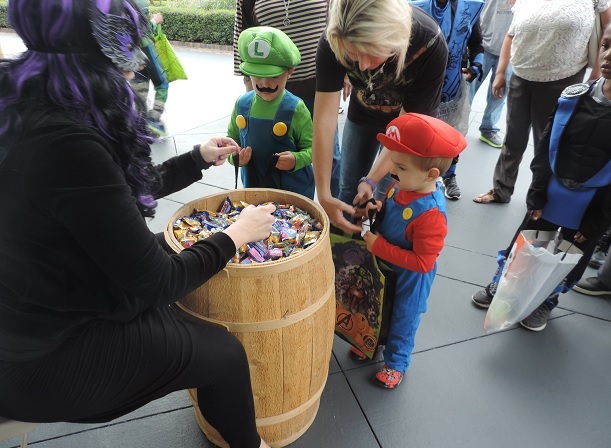 On Halloween night, the little ones can enjoy trick-or-treating throughout Broadway from 4:30pm-6:30pm! Come one, come all as your little ones can receive their favorite sweet treats from your favorite Broadway shops, restaurants and attractions! Don't worry mom and dad, you are welcome to stop in and get a sweet treat as well. May we suggest a hot pretzel from Auntie Anne's, freshly popped popcorn from Sweet South Popcorn Company or a Halloween themed chocolate covered apple from Kilwins! On Halloween night after you've trick or treated and before your little one (or you) dive into your sweet treats, why not have a family dinner at one of your favorite Broadway restaurants and cap off your evening with fireworks over Lake Broadway at 8pm! There are other Boo-tastic events in celebration of Halloween at Broadway. To check them out, click here for our Calendar of Events! So whether you are looking for a place for your little one to trick or treat on Halloween night or you're looking for an adult outing and want to party on The Avenue and compete for the best costume or just looking for some Halloween Hoopla, Broadway at the Beach is the place to be… or Boo!